O&M in Mchinji was launched by the Tikonze Mjigo project (InterAide) in May 2008. To improve water supplies functioning ratio in Malawi (Africa), some Operation and Maintenance (O&M) projects have been undertaken since 1999 by InterAide. 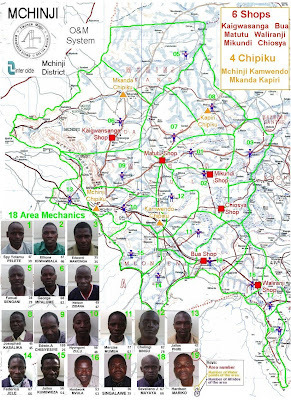 The Madzi Mjigo project in Lilongwe and around Zomba is now managed by Baseda, a Malawian NGO directed by John Chimukho. Recent extension of the project in Mchinji, Dowa, Salima and Kasungu are still managed by InterAide (Tikonze Mjigo project).